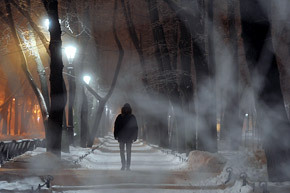 A picture taken late on January 13, 2013, shows a man walking along a path amidst the fog in central Saint-Petersburg. The temperatures in the Russia's second city of Saint-Petersburg reached today -2 C (27 F). Source: AFP/East News.